In addition to having a structural model with a good fit, it is a good practice to show that the proposed model has a better fit than competing models that might be considered as alternatives. A good fit does not prove the proposed theory or structural model best explains the sample data (covariance matrix). An alternative model may produce the same or even a better fit. Thus, a good fit does not prove that the proposed structural model is the only true explanation. Our confidence in the proposed model can be enhanced by comparing it to competing models. The lroposed model (M I) and a competing model (M2) can be compared in terms of differences in X ,incremental or parsimony fit indices (see Figure 22.4). The model diagnostics for the structural model are the scree as this examination is similar to that of the measurement model. Based on the model diagnostics, additional analysis may be conducted. For example, one or more additional paths may be specified that were not hypothesized by the original theory. However. it should be emphasized that any relationships that result based on the modifications do not have theoretical support and should not be treated in the same way as the original relationships based on structural theory. The relationships based on modifications should be theoretically meaningful and should be validated by testing the modified model on new data. 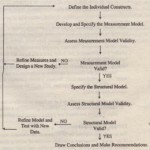 If the assessment of the measurement model and the structural model indicate satisfactory validity, then we can arrive at conclusions and, if appropriate, make recommendations to management. The conclusions can be reached regarding the measurement of key constructs based on the CFA analysis. For example, it may be concluded that a newly developed scale has satisfactory reliability and validity and should be used in further research. Conclusions can be arrived at based on tests of hypotheses in the structural model. It may be concluded that relationships with significant and meaningful estimated structural parameters are supported. The theoretical, managerial, and/or public policy implications of these relationships can be discussed. Appropriate recommendations to the management may be made based on the managerial implications. When SEM is used to test a structural theory, the analysis is analogous to performing factor analysis and a series of multiple regression analyses in one step. We give an illustrative application of SEM in the context of the technology acceptance model (TAMi. TAM is a well-established model that has been used to predict individuals’ reactions to an information technology application.I? 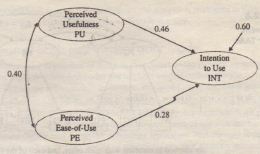 In essence, this model holds that one’s intention to use a technology application (!NT) is determined by two factors, namely, perceived usefulness (PU) and perceived ease-of-use (PE). Perceived usefulness refers to the degree to which the person finds it useful to use the technology application, whereas perceived ease-of-use is defined as the degree to which the person finds it easy to use the technology application. This theoretical framework was applied to explain college students’ use of an educational portal in a certain university. 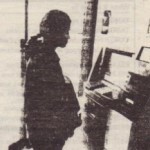 To collect data, a Web-based survey questionnaire was administered to a sample of college students at a large university in the United States. In the survey, respondents were asked to answer the questions related to the use of a Web portal on the campus. A total of 253 completed responses were collected from the survey. The data set used in this analysis can be downloaded from the Web site for this book. In the following, we illustrate how the various steps involved in structural equation modeling presented in Figure 22.2 were carried out. disagree” (I) and “strongly agree” (7). Perceived usefulness was measured by three items. The items were “Using (this Web Site) increases my performance” (PU I), “Using (this Web Site) improves my productivity” (PU2) , and “Using (this Web Site) enhances my effectiveness” (PU3). Perceived easeof use consisted of three items. The items were “(this Web Site) is easy to use” (PEl), “It is easy to become skillful at using (this Web Site)” (PE2), and “Learning to operate (this Web Site) is easy” (PE3).Intention to use was measured by the following three items: “I plan to use (this Web Site) in the next 3 months” (INTI), “I predict that I would use (this Web Site) in the next 3 months” (INT2) and “I intend to Use (this Web Site) in the next 3 months” (INT3). 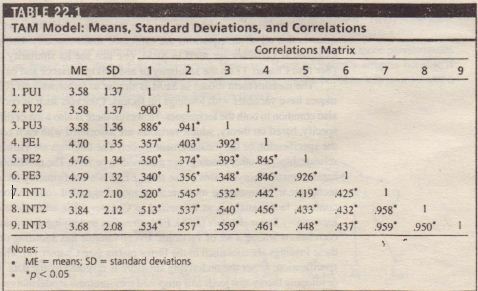 Table 22.1 shows the means, standard deviations, and correlations of the nine variables based on the collected data. 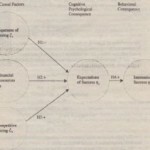 are allowed to correlate with each other, and each of the three factors is associated with the designated three items but not with the other items. Figure 22.8 the depicts the resulting measurement model. The result of data analysis produces model fit as well as various parameter estimates such as item loading, item measurement errors, and factor correlations. 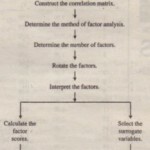 A three-factor measurement model was set up to validate the scales, and a confirmatory factor analysis (CFA) was conducted to test the measurement model. The fit of the model was evaluated based on three different fit indices: comparative fit index (CFI), goodness-of-fit index (GFI) , and root mean square error of approximation (RMSEA). The results of CFA indicated that the model fit the data quite well [xl = 43.32,p < om given that df = 24J; specifically, CFI was found to be 0.99, and GFI was 0.96, and RMSEA was 0.057. 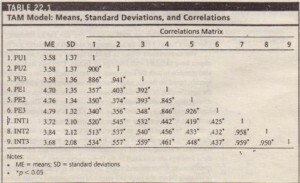 The estimates of correlations and their standard deviations indicated that the scales are empirically distinct from each other. Formally, the square root of the average variance extracted is larger than the correlation coefficients, indicating discriminant validity of the scales. 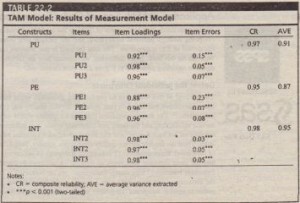 Overall, the measurement model was believed to be appropriate given the evidence of good model fit, reliability, convergent validity, and discriminant validity. The structural model was specified based on TAM theory, as shown in Figure 22.9.